I’m Head of Strategy for the Digital Marketplace, which is part of Government Technology in GDS. We’re helping people who are transforming public services by making it simpler, clearer, and faster for them to buy what they need. We’re looking into lots of ways that we can do this, but we think that one of them is by opening up government procurement and contract data, and improving its quality. I recently attended a workshop organised by the Open Contracting Partnership and talked about what the Digital Marketplace team is doing to make the end to end buying process digital by default, supporting improved disclosure of public contract data. The aim of the workshop was to talk about potential UK government commitments to open contracting in its third Open Government Partnership (OGP) national action plan (NAP), which is due to be published in May 2016. The second NAP is due to be fully implemented by the end of 2015. I believe that, through its procurement and contracting practices, the public sector can deliver better services for citizens at a lower cost to the taxpayer. To help this, we need a quality set of procurement and contracting data. At GDS, we’d like to make that data a public asset. UK government procurement policy wants to increase the accessibility of procurement and contract data to the public through Contracts Finder. This is a great start, and in addition we’re looking at how the Digital Marketplace can support implementation of the Open Contracting Data Standard (OCDS). Other governments are also making progress on their commitments to open contracting. They’re developing legislation, policy, and public dashboards to increase transparency of their procurement and contract data. Having authoritative, trusted lists or ‘registers’ of public sector buying organisations, and suppliers to the public sector, will be a major step towards improving data quality. A recent blog post from the Open Data Institute (ODI) highlighted the need for some basic registers of information for the UK public sector, and listed the top five authoritative datasets they wanted to see from the UK government. We’re looking at how development of the Digital Marketplace can support GDS's work on registers. I think there’s a real opportunity to improve the quality of data on procurement and contracting activity that takes place between public sector buyers and suppliers. It’s the conduct, interactions, and decisions made between buyers and suppliers that are subject to legal obligations of fairness, openness, transparency, equal treatment, and non-discrimination of suppliers. We’re looking at how the Digital Marketplace can capture the data of these interactions between buyers and suppliers. Creating registers of buyers and suppliers, combined with quality data on procurement and contracting activity that’s published in an accessible, structured and repeatable way on Contracts Finder, will represent a paradigm shift in terms of transparency in these areas. I think the Digital Marketplace could then be considered an exemplar of data quality and disclosure in public sector procurement and contracting. 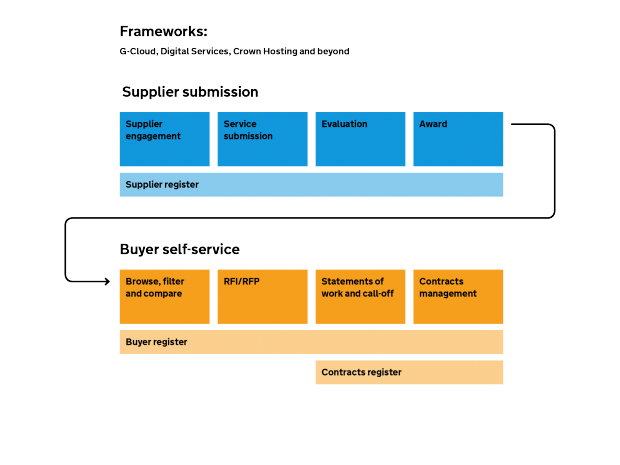 Working with the Crown Commercial Service (CCS) we’ve started looking at creating simpler, clearer contracts with user-centred design. We’ve also been looking at how we can use the OCDS for the Digital Outcomes and Specialists framework. We’ll iterate our approach to open contracting as we make more digital and technology products and services available through the Digital Marketplace. As always, we’ll blog regularly about what we are learning along the way. Follow Warren on Twitter, and don't forget to sign up for email alerts.